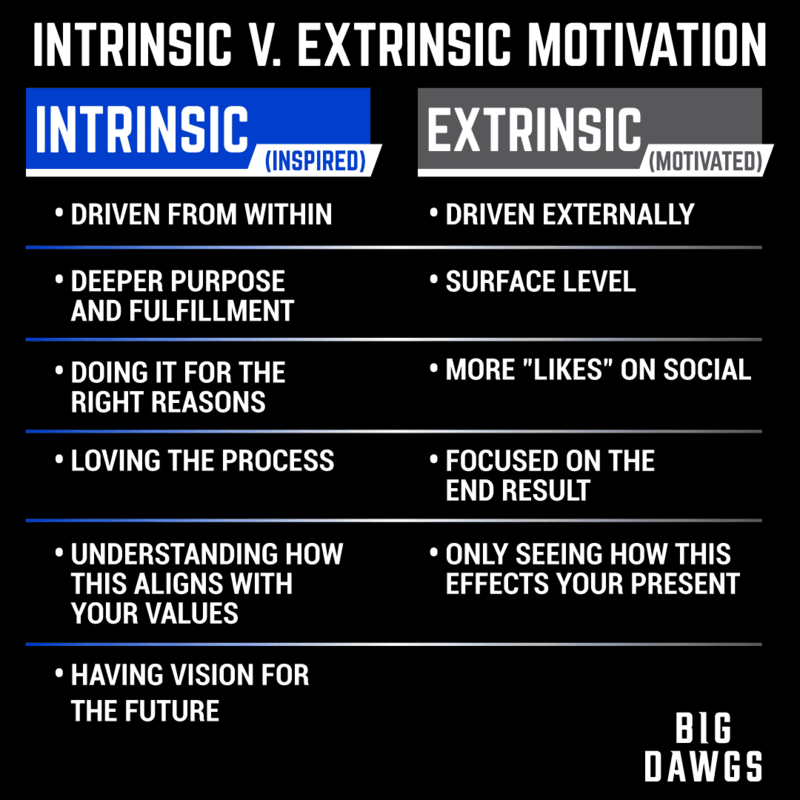 In the last post, we broke down the difference between motivation/extrinsic drive and inspiration/intrinsic drive. We also utilized a great exercise to highlight our highest values, which are the specific items that elicit inspiration/intrinsic drive in our lives (if you haven’t already, now would be the time to go read that blog post and perform the exercise within it). We highlight a long term goal that has utility for us. However, there are behaviors, things we value in the short term, that are negatively impacting our trajectory towards it. Thus, we layout, in our own mind and on paper, the pieces we would need to implement to reach that goal (this is also a great opportunity to seek out others who have reached that goal for insight and guidance). Then we look at our current approach and see which areas we can improve to move us closer to the goal. Lastly, we create short term goals to help ensure we are trending towards the long term goal. We Identify our highest values. From there, we identify long term goals that are extensions of those values. To summarize, we all live by a set of values/priorities, organized from most to least important in our lives. The highest on that list are spontaneously inspired from within (intrinsic drives) to enact and create fulfillment in us. The lowest on that list require outside motivators (extrinsic drives) to achieve it if we decide to give it the attention and effort it demands. The first step in this process is to identify what our highest values are. From there, we can either create goals that match our values or change our values to match goals. Both approaches work. The key for both is becoming conscious to our current state. From there, identifying what we need to change to move us closer to where we want to go. Create a plan that we can implement, manage, and refine continually. When you begin doing something you are truly inspired to do you don’t view it as a chore because you truly love it, there’s no strain. It is an embraced action that leads to fulfillment. You’re not here to live in anybody’s shadows. You’re not here to be living by others projected expectations. You’re here to do what is inspiring to you. By doing so, your authenticity will change your life and those around you.